This paper considers the treatment of risk and uncertainty in the recently established social cost of carbon (SCC) for analysis of federal regulations in the United States. It argues that the analysis of the US Interagency Working Group on Social Cost of Carbon did not go far enough into the tail of low-probability, high-impact scenarios, and, via its approach to discounting, it mis-estimated climate risk, possibly hugely. Given the uncertainty about estimating the SCC, the paper concludes by arguing that there is in fact much to commend an approach whereby a quantitative, long-term emissions target is chosen, and the price of carbon for regulatory impact analysis is then based on estimates of the marginal cost of abatement to achieve that very target. The social cost of carbon, or marginal damage caused by an additional ton of carbon dioxide emissions, has been estimated by a U.S. government working group at $21 in 2010. That calculation, however, omits many of the biggest risks associated with climate change, and downplays the impact of our current emissions on future generations. This reanalysis explores the effects of uncertainty about climate sensitivity, the shape of the damage function, and the discount rate. This paper shows that the social cost of carbon is uncertain across a broad range, and could be much higher than $21. In the worst case, it could be almost $900 in 2010, rising to $1,500 in 2050. The most ambitious scenarios for eliminating carbon dioxide emissions as rapidly as technologically feasible (reaching zero or negative net global emissions by the end of this century) require spending up to $150 to $500 per ton of reductions in carbon dioxide emissions by 2050. Using a reasonable set of alternative assumptions, therefore, the damages from a ton of carbon dioxide emissions in 2050 could exceed the cost of reducing emissions at the maximum technically feasible rate. Once this is the case, the exact value of the social cost of carbon loses importance: the clear policy prescription is to reduce emissions a rapidly as possible, and cost-effectiveness analysis offers better insights for climate policy than cost-benefit analysis. Recent thinking about the economics of climate change has concerned the uncertainty about the upper bound of both climate sensitivity to greenhouse gases and the damages that might occur at high temperatures. This argument suggests that the appropriate probability distributions for these factors may be fat-tailed. The matter of tail shape has important implications for the calculation of the social cost of carbon dioxide (SCCO2). In this paper a probabilistic integrated assessment model is adapted to allow for the possibility of a thin, intermediate or fat tail for both the climate sensitivity parameter and the damage function exponent. Results show that depending on the tail shape of the climate sensitivity parameter the mean SCCO2rises by 29–85%. Changes in the mean SCCO2due to the adjustments to the damage function alone range from a reduction of 7% to a rise of 12%. The combination of both leads to rises of 33–15%. Greater rises occur for the upper percentiles of the SCCO2estimates. Given the uncertainties in both the science and the economics of climate change different tail shapes deserve consideration due to their important implications for the range of possible values for the SCCO2. Reducing greenhouse gas emissions not only lowers expected damages from climate change but also reduces the risk of catastrophic impacts. However, estimates of the social cost of carbon, which measures the marginal value of carbon dioxide abatement, often do not capture this risk reduction benefit. Risk-averse individuals are willing to pay a risk premium, an additional amount beyond the difference in expected damages, to reduce risks. This paper reviews the methods used and estimates obtained for calculating a risk premium to be included in the social cost of carbon. While more research is needed in this area, work to date suggests a positive, and potentially substantial, risk premium on the social cost of carbon is warranted. This paper estimates the growth rate of the social cost of carbon. This is an indication of the optimal rate of acceleration of greenhouse gas emission reduction policy over time. The paper finds that the social cost of carbon increases by 1.3% to 3.9% per year, with a central estimate of 2.2%. Previous studies found an average rate of 2.3% and a range of 0.9 to 4.1%. The rate of increase of the social carbon depends on a range of factors, including the pure rate of time preference, the rate of risk aversion, equity weighting, the socioeconomic and emission scenarios, the climate sensitivity, dynamic vulnerability, and the curvature of the impact functions. A new version of the PAGE integrated assessment model, PAGE09, is introduced. The most important scientific, impact, emission and adaptation inputs in the latest default version of the model, PAGE09 v1.7 are described. The scientific and economic impact results are presented for a business as usual (BAU) emissions scenario, and for a low emissions scenario which aims to have a 50% chance of keeping the rise in global mean temperatures below 2 degC. Today’s mean social cost of CO2 is about $100 per tonne of CO2 in the BAU scenario, and about $50 per tonne in the low emissions scenario. The major influences on the SCCO2 are found to be the transient climate response, the pure time preference rate, the elasticity of the marginal utility of consumption, the feedback response time of the earth and the weight on non‐economic impacts. Less than 10% of the mean SCCO2 comes from impacts in annex 1 from annex 1 emissions, while over 45% comes from impacts in the rest of the world (RoW) from RoW emissions. About one third of the mean SCCO2 comes from impacts in the RoW caused by emissions in annex 1, while just over 10% comes from impacts in annex 1 caused by emissions in the RoW. In 2010, the U.S. government adopted its first consistent estimates of the social cost of carbon (SCC) for government-wide use in regulatory cost-benefit analysis. This paper examines a number of the limitations of the estimates identified in the U.S. government report and elsewhere and review recent advances that could pave the way for improvements. It considers in turn socioeconomic scenarios, treatment of physical climate response, damage estimates, ways of incorporating risk aversion, and consistency between SCC estimates and broader climate policy. This paper surveys the literature on the economic impact of climate change. Different methods have been used to estimate the impact of climate change on human welfare. Studies agree that there are positive and negative impacts. In the short term, positive impacts may dominate, but these are largely sunk. In the longer term, there are net negative impacts. Poorer people tend to be more vulnerable to climate change. There is a trade-off between development policy and climate policy. Estimated aggregate impacts are not very large, but they are uncertain and incomplete. Estimates of the marginal impacts suggest that greenhouse gas emissions should be taxed, and that the emission reduction targets announced by politicians are probably too ambitious. This paper defines the rate of inequity aversion, distinguishing between the pure rate and the consumption rate. The social cost of carbon is very sensitive to equity weighting and assumptions about the rate of risk and inequity aversion. Estimates for the consumption rate of inequity aversion for recent data suggest that the equity-weighted social cost of carbon is less than 50% larger than the unweighted estimate. This paper sets out a revised approach to valuing carbon in policy appraisal, following a review undertaken within Government in the course of 2008 and early 2009. It concludes that the approach, based on estimates of the SCC, should be replaced with a target-consistent approach, based on estimates of the abatement costs that will need to be incurred to meet specific emissions reduction targets. The case for change is motivated by the considerable uncertainty that exists surrounding estimates of the SCC. The change will have the effect of helping to ensure that the policies the UK Government develops are consistent with the emissions reductions targets that the UK has adopted through carbon budgets and also at an EU and UN level. This paper presents a meta-analysis of over 200 estimates of the social cost of carbon. The results confirm that a lower discount rate implies a higher estimate; and that higher estimates are found in the gray literature. 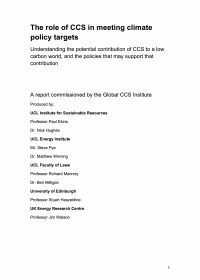 It is also found that there is a downward trend in the economic impact estimates of the climate; that the Stern Review’s estimates of the social cost of carbon is an outlier; and that the right tail of the distribution is fat. There is a fair chance that the annual climate liability exceeds the annual income of many people. There is an increasing interest in the economics of climate change, and the marginal damage costs of emissions, known as the Social Cost of Carbon (SCC). In 2002, the UK Government recommended an SCC for policy appraisal. A recent review of this SCC was commissioned and summarised in this paper. The authors conclude that SCC estimates span at least three orders of magnitude, reflecting uncertainties in climate change and choices of key parameters/variables (discount rate, equity weighting and risk aversion). Estimates also vary due to their coverage, and a risk matrix was developed to compare climate change effects (predictable to major events) against impacts (market, non-market and socially contingent). From several lines of evidence, the current lower SCC value is considered a reasonable lower benchmark for a global decision committed to reducing the threat of dangerous climate change. An upper benchmark was more difficult to deduce, though the risk of high values was considered significant. It is currently impossible to provide a central value with confidence. The study also reviewed the use of the SCC in policy, from project appraisal to long-term climate policy, and used stakeholder interviews to elicit views. A wide diversity of responses was found: whilst most considered some values are needed for policy appraisal, nearly all had reservations for long-term policy. From this, the authors propose a two tier approach. The economic benefits of climate change should be considered when setting long-term policy, but a wider framework is needed (i.e. than cost-benefit analysis). This should include a disaggregated analysis of economic winners and losers by region and sector, and key impact indicators such as health and ecosystems. It should also consider the full risk matrix (i.e. non-marginal/irreversible effects). Once long-term policy is set, shadow prices for appraisal across Government are useful, provided they are consistent with the long-term goal, and are applied consistently.